Hotel Esplendid Costa Brava in Blanes. This Hotel Accommodation by the beach in Catalonia on the Costa Brava, has a swimming pool, is close to the beach. Prices from 46 EUR. Welcome to the Hotel Esplendid Costa Brava.Hotel Esplendid is just 300 metres from the beach and marina, in the Costa Brava resort of Blanes. It has indoor and outdoor swimming pools, a sauna and a gym. The hotel has tennis and squash courts and attractive gardens. For more on this Hotel Accommodation by the beach in Catalonia on the Costa Brava please click on the availability buttons above and below. 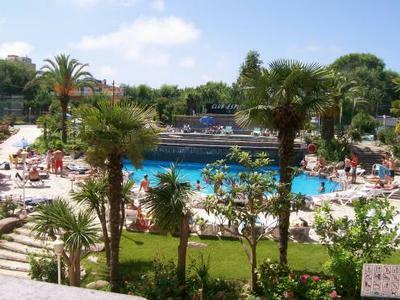 The Hotel Esplendid provides excellent Hotel Accommodation in Blanes, Catalonia, Costa Brava Spain. The address is Avda Mediterraneo 17, Blanes , 17300.